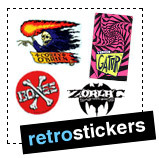 Welcome to the RetroSkateStickers.com Store! The place to buy MINT vintage skate stickers for your collection! Every skateboard sticker for sale is 100% authentic and in absolutely pristine condition. I'm an avid collector and take great pride in old school skate stickers, so quality is top priority. If you find a sticker you love, don't wait, it may never return to our store when sold. Most of our stickers are well over 25 years old, extremely rare, and difficult to find. All major credit cards and paypal accepted. Shipping to any country is just $6.50. Please bookmark us, I list new stickers weekly. Nothing beats the skateboard graphics of the past! 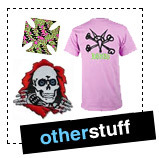 - Shipping to any country is a flat rate $6.50, and we ship worldwide!